With an aim to tap the anger of the farmers against the ruling dispensations, almost all the senior Left leaders stressed that they have been treated like “beggars and ignored by both the governments at the state and centre”. 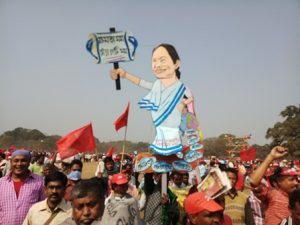 The marginalised Left Front on Sunday made yet another desperate attempt to revive its dwindling fortunes in West Bengal by organising a mega rally in Kolkata where it described the ruling Trinamool Congress (TMC) and BJP as political bedfellows whose ouster is necessary to put the country into the path of development. 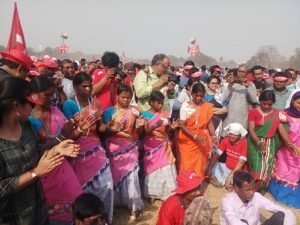 While kicking off its campaign for the upcoming General Elections, the Left leaders took heart from the sizeable turnout at the Brigade Ground in Esplanade and spoke aggressively against the faulty policies of the TMC and BJP that has caused distress among every section of the society including farmers and youth. The Brigade rally that was held after three years was attended by leaders of 17 Left Front parties. The noticeable presence in the rally was former CM Buddhadeb Bhattacharjee who couldn’t get on the dais because of ailing health. The senior Left leader remained seated in his white ambassador for nearly an hour and all top leaders including Sitaram Yechury met him inside his car. Bhattacharya remained at the ground for nearly an hour before departing. They urged supporters to strengthen the hands of Left in the Parliament as it is the only front fighting for their rights while giving a call for the ouster of BJP and TMC. 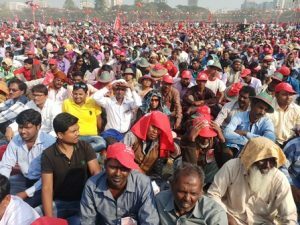 The Left leaders also came down heavily on the West Bengal Government blaming its policies for industrial drought that has left many aspirants unemployed in the state. Biman Bose, senior CPI (M) leader, who lead the charge alleged that the only agenda of the TMC is to stay in power by adopting whatever means possible. “Their only agenda is to stay in power and not development. Farmers are living in distress and are committing suicides. She (read Mamata Banerjee) boasts of having tripled the income of farmers. Then, why they are ending their lives? The state government has resorted to loot and goons have been unleashing violence in the state. They even tried to threaten our supporters who were coming to attend the rally but they still made it braving all dangers,” said the veteran leader drawing applause from the crowd who had come from across the state to attend the rally. Describing Prime Minister Narendra Modi as a “chowkidar” (watchman), under whose watch loot and communalism were rampant in the country, CPI (M) general secretary Sitaram Yechury sought the formation of an alternative democratic government at the Centre. The senior Left leader also slammed the PM Kisan Samman Nidhi scheme and termed it yet another ‘jumla’ for gaining power. “He has been handing over lollipop to the farmers for their votes. They (farmers) are not beggars to be given Rs. 6,000 annually. The unemployment rate has touched all time high during 2017-18 but he (Modi) is claiming to have created enough employment opportunities in the country,” he said. The assessment by the National Sample Survey Otaganisation (NSSO) conducted between July 2017 and June 2018, showed the unemployment rate stood at 6.1 percent – the highest since 1972-73. The report said that joblessness stood at 7.8 per cent in urban areas compared with 5.3 per cent in the countryside. The data is significant because this was the first comprehensive assessment of India’s employment situation conducted after Modi’s decision in November 2016 to withdraw most of the country’s banknotes from circulation overnight, the report said. Senior Left leader Surjya Kant Mishra said that Modi has put the country on the path of destruction during his tenure. “He has destroyed almost all the democratic institutions in the country like CBI, ED and others. The TMC and BJP are both hand-in-glove with each and only Left is capable of giving alternative to the corrupt governments,” he said. Dipankar Bhattacharya, the General Secretary of the Communist Party of India (Marxist–Leninist) Liberation making an indirect reference to the party losing power in 2011 in Bengal conceded that party has made some mistakes but is now ready to correct them. Md Salim, CPI MP, vowed to make a re-start to resurrect the party in West Bengal in order to save the state from the atrocities of the ruling party who has resorted to hooliganism and extortion. “We take a vow at this historical rally to remove the party from power that is involved in extortion and other heinous crimes. We cannot do it alone and need your support. Modi has brought Citizenship (Amendment) Bill to do divisive politics and divide people in communal lines. During its three decade rule, the Left never allowed communal politics in West Bengal but now such forces have been gaining ground,” he said. The turnout of youth in large numbers elated the Left leaders.